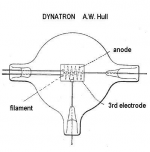 A filamentary cathode, a helical anode at high potential and an outer cylinder called "3rd electrode" kept at a lower potential. The secondary electrons bounced back from the 3rd electrode are collected by the anode. 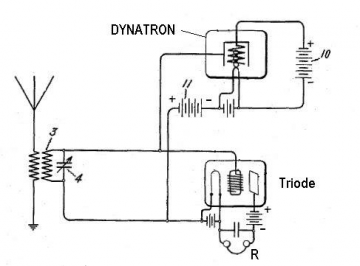 The Dynatron behave as a true negative resistance device.